December 24: Invite your friends & family and join us for our Christmas Services! Invite your friends and family and join us for our Christmas Services! Listen to 287 past sermons by Pastors Kenny Newsome, Dan Elmore and others in the Pender Podcast. June 5: New Directions Sunday School Class. New study entitled “Soul Keeping – Caring for the Most Import Part of You” by John Ortberg. We meet in Rooms 218-220 at 9:30 AM. If any questions, feel free to contact Carol Wilson If any questions, feel free to contact Carol Wilson by email or at (703) 815-1744. June 5: The 10:30am Sunday School Class is reading a new study by Adam Hamilton entitled Seeing Gray in A World of Black and White: Thoughts on Religion, Morality, and Politics. Contact Angie Green for more information. June 5: The Pender Youth Orchestra, 4:15-5:00 pm. The Youth Orchestra is open to all youth grades 7 through 12 who play a wind, brass, stringed or percussion instrument. New members are always welcome! The Orchestra plays 4-5 times during Sunday morning worship from December-June. More information. Please join us today Sunday, June 7, in worship at the 8:15, 9:30 and 11:00 Services. June 7 – The Children’s Musical, The Sailor’s Bible, will be presented by the Asbury and Wesley Choirs of Pender UMC. This new children’s musical includes three Bible stories: Noah and the Great Flood, Jonah and the Great Fish, and Paul’s Shipwreck. Each story features the ocean as a symbol for the chaos of life and shows how only the power of God is greater than the natural forces of wind and wave. It’s all done with a childlike playfulness full of humor and songs rich with catchy melodies. June 7-July 3: Music Camp Registration is open until we reach 60 campers. Music Camp will run from July 6-10, 2015 in the afternoon. June 7: New Directions Sunday School Class. Mark Batterson’s book entitled “The Circle Maker – Praying Circles Around Your Biggest Dreams and Greatest Fears”. We meet in Rooms 218-220 at 9:30 AM. If any questions, feel free to contact Carol Wilson If any questions, feel free to contact Carol Wilson by email or at (703) 815-1744. June 7: Sunday School Class: The Truth Project (began September 21) This Focus on the Family’s DVD series, with 26 one-half hour lessons taught by Dr. Del Tackett, is the starting point for looking at life from a Biblical perspective. lesson discusses the relevance and importance of living the Christian worldview in daily life. June 7: Sunday School Class: The Good and Beautiful God (began September 21) (Room 205 – Library) A new Sunday School course immediately after the 9:30 am worship service led by Brian and Angie Green will be reading and discussing this book. To sign up or find out more information, please sign up on the Connection Card in the bulletin on Sunday. Please join us this Sunday, June 7, in worship at the 8:15, 9:30 and 11:00 Services. 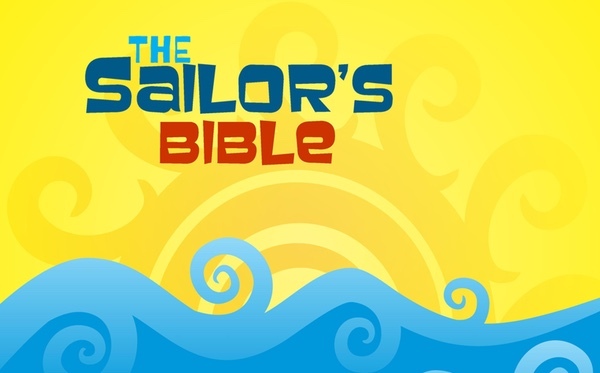 The Sailor’s Bible ~ Sunday at Pender UMC!